Fashion a classy dining space with this five piece round dining table and side chair set. Lifted on a simple pedestal base that slightly curves outward, the table features a hammered metal table top, lending a unique textual depth to the piece. A round shape makes it perfect for conversation and entertaining guests, giving an intimate, homey atmosphere to your dining room. Traditionally styled with a formal feel, this table has a warm Roletta Brown metal finish that instantly calms and comforts. Accompanied are four coordinating Oxford Side Chairs. Upholstered in a matching Stallion Brown, the chair emanates warm brown tones to soften and soothe, and the upholstered seat ensures long lasting comfort for you and your dinner guests to enjoy. 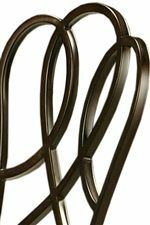 A decorative ribbon back showcases intricate scroll metalwork to draw the eyes, lending genuine visual interest and appeal to your dining room. 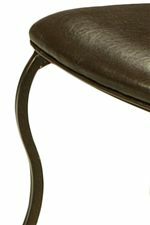 Gently curved front legs give a sense of shape and movement to the chairs, offering a stark contrast to the back legs which stand straight and tall. Classically designed, this five piece table and chair set is an easy way to dress up your kitchen or dining space and add extra, stylish seating to your home. The Oxford 5 Piece Table & Chair Set by Pastel Minson at AHFA in the area. Product availability may vary. Contact us for the most current availability on this product. Table Info Includes one round table with a 45" hammered metal top and pedestal base. Side Chair Info Upholstered ribbon back side chairs. Case Detail Curved front legs. Case Construction Crafted from steel.